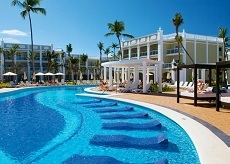 Revel in a stay at the beautiful Ocean El Faro! With stunning ocean views, this beachfront resort features amazing swimming pools, a relaxing stream, and a family area with a water park! Themed restaurants, a spa (fee), and an entertainment program ensure that fun is had and memories are made! Plus, guests can choose to stay in the Family, Adults-Only, or Privilege sections during their stay. 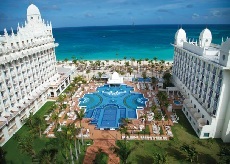 The 24-hour all-inclusive Riu Palace Peninsula is located at the heart of Cancun. The resort is situated on a dazzling stretch of white sand beach and framed by tropical vegetation and crystal clear turquoise water. Enjoy a day of relaxing by taking care of your body in the Renova Spa. There are a variety of treatments to choose from to relax the mind, body and soul. The gym, steam bath, and Jacuzzi are free of charge. Get your heart pumping with daily activities including volleyball, RiuLand Mini-Club, and watersports, including windsurfing, kayaking, and snorkeling. Whatever your taste buds desire, you are sure to be satisfied with a huge variety of cuisine, from local to international recipes. Buffets and on-the-spot cooking stations are available nightly and feature a theme buffet three times a week. A la carte options include Japanese, Fusion, Italian, Mexican, and a Grill and steakhouse. Recently revamped menus now offer a wide range of cuisine and finer ingredients at the a la carte restaurants, as well as the incorporation of a vegetarian menu in all restaurants. Enjoy a buffet breakfast every day with fresh, tropical juice. Live shows, music, and other entertainment keep adults entertained all day and night. 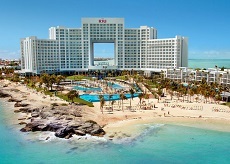 Non-stop fun awaits at the other three RIU Hotels in Cancun! Guests staying at Riu Palace Peninsula have exchange privileges at Riu Caribe, Riu Cancun, andRiu Palace Las Americas (dinner dining excluded). The Hotel Riu Santa Fe, located on the southern tip of the Baja California peninsula, on El Médano beach, offers impressive facilities to make your stay unforgettable. This 24h all-inclusive hotel in Los Cabos gives you free WiFi, a varied gastronomic offer, fun entertainment programmes and the exclusive service the brand is known for. And, you'll find plenty of fun thanks to the RIU POOL PARTY events, a series of lively parties by the pool with music and live shows, for adults-only. This hotel on El Médano beach with 24h all-inclusive service has a varied gastronomic offer for enjoying amazing culinary experiences. No doubt you'll be impressed by the breakfast buffets with show cooking, the Asian, Mexican and Italian restaurants, and the wide variety of dishes in the main restaurants. And if that weren't enough, in the ten bars located in different areas of the hotel, you can savour the best snacks and appetisers. The Hotel Riu Santa Fe also has an animation team so that you never lack for entertainment: during the day you can enjoy sports and activities, and at night the hotel disco and live shows. And, the youngsters in the family have the RiuLand kid's Club, a special entertainment programme for them that guarantees them a good time on their holiday. And if what you need is relaxation, at the Renova Spa you can enjoy a jacuzzi, sauna and Turkish bath, and also arrange for some of our treatments. 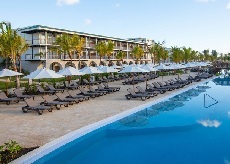 Sandos Playacar Beach Resort is an exceptional all-inclusive beach resort set along a wide stretch of glorious white sand caressed by the turquoise blue of the Caribbean Sea. Situated on the southern edge of Playa del Carmen, the master-planned community of Playacar offers bikers and hikers the perfect spot to enjoy a stroll while admiring lush green jungle and Mayan ruins. 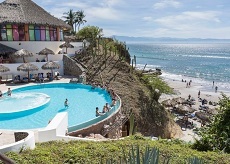 Head over to Playa del Carmens famous 5th Avenue which is a short 10 minute bike ride away. 5th Avenue offers great shopping, dining, coffee shops, and people watching. Spend long, peaceful days steeped within the refreshing waters of one of nine gorgeous swimming pools, including a separate pool area exclusively for adults and five just for kids. Riviera Blue Snack Bar is located poolside, open for brunch and lunch with some tasty snack options. Agave Blue Moon Bar (exclusively for Select Club Adults Only) offers beachside service with drinks and snacks in the mornings and afternoons. The friendly animation staff is on hand each day to make sure the entertainment and fun never stop. The water, land, and day/night activities come together to offer an unforgettable vacation experience. Be sure not to miss the nightly entertainment including cabaret shows, music performances and theme shows. The new family area is a must for families looking for an amazing beach vacation. 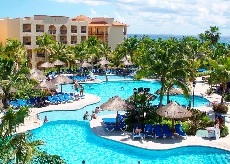 There is an oceanfront main pool and swim-up bar and an incredible waterpark for kids! There is also transportation from the family area to the beach area. Enjoy an exciting variety of on-site watersports at no extra charge, or try your hand at a game of tennis on one of four floodlit courts. Kids and teens enjoy carefree days with new friends and peers at their own separate clubs and activity centers. Teens can kick back and play games of ping-pong, billiards, foosball and video games. A world of fun and discovery awaits your little ones. Activities include a playground, swimming, mini-golf, face painting, movies and more! Experience complete harmony with nature when you rest, relax and indulge in the treatments of Spa Sandos (fee). Indulge in the culinary delights offered at any of seven a la carte and three buffet restaurants. Savor delicious Italian, Brazilian, Mediterranean, Asian, French and Mexican cuisine, with no restrictions on the number of nights you choose to dine at either (reservations are required only for Brazilian restaurant). Elegant, welcoming, comfortable, and priced just right! At the Sandos Playacar Beach Resort, everything is provided for your enjoyment and pleasure - Food, drinks and the warm Caribbean sun. Welcome to Mexico! 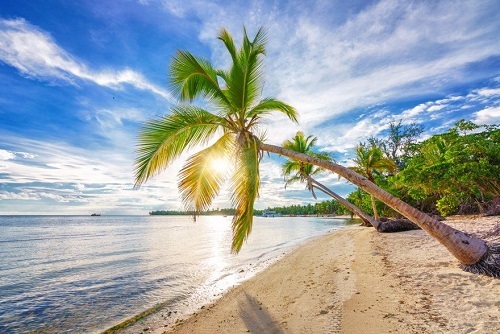 In a place called Paradise, everything should be perfect. 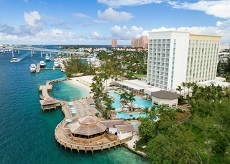 Warwick Paradise Island Bahamas - All-Inclusive pursues perfection in all aspects of luxury and hospitality, and that's why it's the perfect place for you to indulge, unwind, and enjoy all that Paradise Island, Nassau and the Islands of the Bahamas have to offer. An adult-only 16+, all-inclusive resort hotel, Warwick Paradise Island Bahamas  All-Inclusive takes any stresses out of your vacation, leaving you to simply enjoy yourself. Relax on the resort's private harbour beach or take in some of the best views of Nassau Harbour and the island itself from the 10,000 sq. ft. Sunset Terrace and Boardwalk on the harbour.